Als je gaat vergaderen in het Engels of je moet een vergadering leiden in het Engels dan vind je hier 13 tips. Als je deze volgorde aanhoudt dan moet het lukken om een vergadering goed te leiden ook al is die in het Engels. Vergaderen in het Engels, wat doet de voorzitter? Vergaderen in het Engels is ‘attending a meeting’. 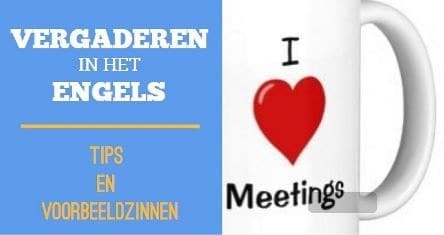 Het start met de agenda als basis..
Give people the agenda on time so that they can prepare for the meeting. If they have the information on time they may come up with ideas or solutions for problems. Time is important. Watch the time. Don’t let meetings run on unnecessarily. If an issue can’t be resolved, go on to the next subject. Don’t call meetings outside office hours. If you want people to be enthusiastic make sure the meeting is within office hours. Meetings are to discuss business. Allow a short amount of time for small talk at the beginning of the meeting but make sure participants get down to business after a few minutes. Stick to the subjects on the agenda and not go off the point. Give everyone an equal chance to participate and don’t let one or two people dominate the meeting. The chair opens the meeting. I’m glad you could all make it today. It’s good to see you all. The purpose of this meeting is..
John has sent his apologies. Are we missing anyone this morning? Unfortunately, Tim isn’t able to attend. The meeting today is about .. I think you all have a copy of the agenda. Why don’t we all introduce ourselves for the benefit of the new person. Mandy, why don’t you introduce yourself. Let’s go around and introduce ourselves. Could you tell us something about yourself and what you do? John, what is your opinion? What is your view on that? Mary, how do you feel about that? Janet, would you like to offer any information on this? What are your thoughts on…? Can I just come in here. Meer hierover in: je mening geven in het Engels. Could you just let Mary finish what she was saying please. One at a time please. Could you just hang on a moment please. Could I just finish what I was saying please. I have two points I would like to make. Sorry could you let me finish? Could I just finish making my point. Can we add that topic to the agenda for our next meeting? Would you mind if I said something. Sorry, I was just saying something. Zakelijk communiceren in overleggen 125 voorbeelden van gesprekstechnieken. Let’s just move on to the next point on the agenda. Let’s leave that for the moment. Can we come back to that later if we have time. Could you go over that again please? If I understand you correctly you are saying.. Sorry I don’t follow you. Sorry, I’m not with you. Is iedereen het er mee eens? So, do we all agree to that? Let’s put it to a vote, all in favor, raise your hands please. Let’s go over what we have discussed. Any final thoughts before we close the meeting? The next meeting will be on…. Bij een vergadering hoort ook een verslaglegging. Lees ook hoe je een professioneel zakelijk gesprek in het Engels voert. Misschien moet je wel een presentatie geven in het Engels. Bekijk dan het stappenplan voor een goede opbouw. Veel succes. Deel dit artikel hieronder, bedankt daarvoor. Vergaderen en notuleren in het Engels, the way to do it!